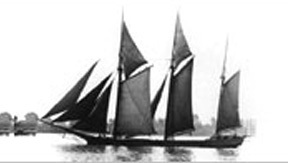 This three masted schooner was originally launched in 1870 from Manitowoc, Wisconsin as the H.C. Albrecht. She was later sold and renamed the Thomas Hume. With a length of 132 feet and a beam of 26 feet, the Thomas Hume saw over 20 years of service to the lumber industry in the area. In September of 1891, the Thomas Hume went missing in a squall with six souls on board. At the time, based on the circumstances surrounding the disappearance, there was quite a few theories surrounding the ships disappearance. One such theory was that the captain sailed the ship to another port, repainted her and claimed her as his own. Of course these theories were finally put to rest when an archaeological team conducted a survey of a newly found wreck in 2010, positively identifying it as the Thomas Hume. Nowadays, she sits in 145 feet of water, a perfect dive for experienced and trained divers with technical equipment and dive planning ability. We visit the Thomas Hume from Hammond Marina.